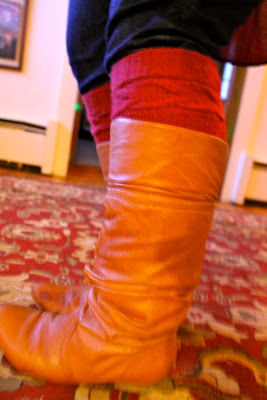 Bossy Italian Wife : Quick Fix: Homemade Leggings! Most times my quick fixes are of food. But I know you stuffed yourself about as full as that Thanksgiving Day turkey and you might not be able to stomach even more food right now. I get it. Instead, let's talk clothing. Specifically, leggings! I love leggings that peak out from boots. One problem: I can never actually find leggings in the stores. This is partially because I hate shopping from store to store looking for a single item. And spending money, let's face it, is not my favorite thing to do. If you are not heading out into the droves of people and hitting up black friday, maybe instead you want to stay in and make yourself some leggings. 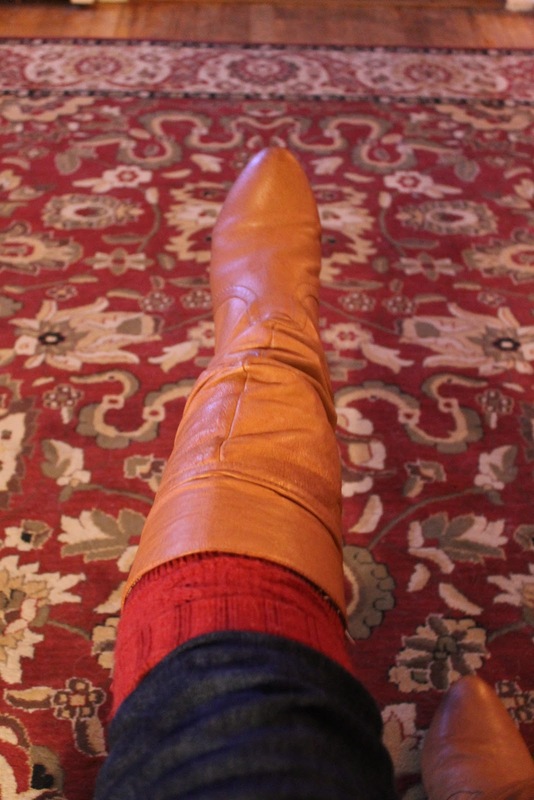 So, if you have an old sweater laying around (or as was the case for me, in my attic in a bag that I had fully intended to take to the thrift store sometime last year) then you have a pair of leggings! I loved this little knitted detail on the sleeve, though. This is exactly what made this sweater great for leggings. That and also because it's soooo cozy! Let's take a moment to discuss scissors. My husband is a collector of scissors. I asked him why he collected scissors and he told me he likes the metal ones because the plastic ones are cheap. And he is a stickler of the concept of "different scissors for different things." This particular pair of scissors are for fabric. DO NOT CUT PAPER WITH FABRIC SCISSORS! This is important. Because then, when you want to cut fabric, they will slice like a warm knife through butter. Basically you are going the sleeves off of the sweater. I lined mine up to do it in one fell swoop. How about those fabric scissors?!?! Then I slid those suckers up over my skinny jeans and pulled on my boots! I love the way they look, and also how warm they keep my legs! On a cold day, this is a winning combination as well as a great fashion statement! I would also like to say it took me about 5-7 tries to get this (slightly out of focus) side view of my own leg. Persistence pays off!! !